Stuart Brain on Fife Historic Vehicle club. Jeff Buttar on Fife Historic Vehicle club. We were delighted to win the Pride of the Forth Valley Awards 2017 Best Visitor Attraction, voted for by the listeners of Central FM. This went well with our 2017 TripAdvisor Certificate of Excellence – our third in consecutive years! It turns out that we weren’t the only one that picked up awards in November, we all got together on the steamer to show off our awards! Trossachs organisations have won three of the UK’s most prestigious business and community awards. 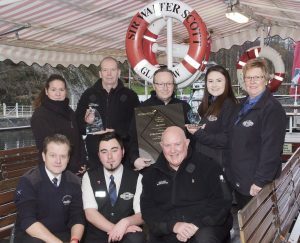 Best Visitor Attraction, Forth Valley Awards 2017: Central FM listeners voted to give this award to Loch Katrine’s Steamship Sir Walter Scott. Diamond Award 2017: Hoseasons customers from across the UK voted to recognise Forest Holidays Strathyre for outstanding customer service. Not for Profit Organisation of the Year, UK Heart Safe Awards: This award went to the already multi-award-winning Trossachs Search and Rescue. Completing the triple win was Trossachs Search and Rescue; a charity in its 20th year whose volunteers brave the elements to support local communities and emergency services across the rural expanses of Stirling. Nikola Thomson and Joanne Reid attended the award ceremony at the Hilton Deansgate in Manchester. runner up in the ‘Community Responder Scheme of the Year Award’. The UK Heart Safe Awards which celebrates outstanding organisations who have created Heart Safe environments for their workplace and local communities. For over 150 years Loch Katrine has offered a serene and tranquil spot for visitors from all over the world. Today, The Steamship Sir Walter Scot Ltd is an Award Winning Tourist Attraction offering loch cruises on our 118 year old classic Steamship or more intimate vessel Lady of the Lake. Easy access to walking and cycling will encourage you to return year after year. Our Eco Lodges and Motor Home bays allow for a longer, more relaxing stay.